Pumpkin or pecan? Pecan or pumpkin? What to do? Which to eat? If you’re as bad at making these major life decisions as I am, then maybe Dorie’s Thanksgiving Twofer pie (chosen for us by the lovely Vibi of La casserole carrée) is for you. It starts with a pumpkin pie custard, and then gets topped with a pecan pie goo– no need to choose! Okay, so it is not the most beautiful pie I have ever made (even though I tried to gussy it up with a little powdered sugar for its photo session). No matter– it’s what’s inside that counts, right? And what’s inside is really tasty. To tell the truth, it was not exactly what I was expecting. I thought the two layers would stay separate and distinct. The nuts themselves remained suspended on top, but the pecan goo intermingled with the pumpkin custard…it was really quite delicious, though. 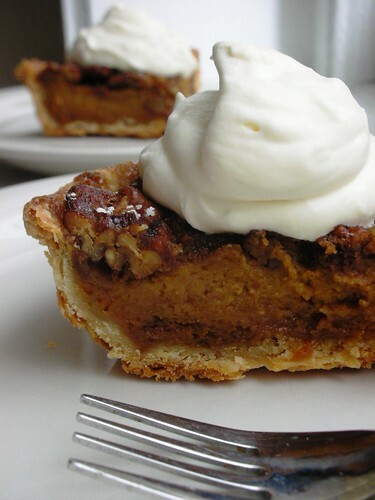 I spiked mine with bourbon instead of rum (cause that’s what I like with pecan pie), and piled the whipped cream high! I made half a recipe and used my new cute little red dish. Tracy from Cake Batter and Crumbs sent it to me, and I just love it!! My only beef with Dorie’s recipe is that it took much longer to bake than she indicated, even with the small size. I kept upping the oven timer…five more minutes, five more minutes. I feel like I did it a zillion times, but I probably tacked on an extra 15 to 20 minutes in all. I was a little worried it was overkill and that I’d wind up with a curdled mess, but I can give thanks that my Thanksgiving pie came out just right. I wish all of my American friends a safe and happy Thanksgiving! Even though everything feels a bit more challenging this year than last, everyday (and with every news broadcast) I’m reminded of just how much I have to be thankful for. For the pie recipe, look in Baking: From My Home to Yours by Dorie Greenspan. You can also find it in Vibi’s post. 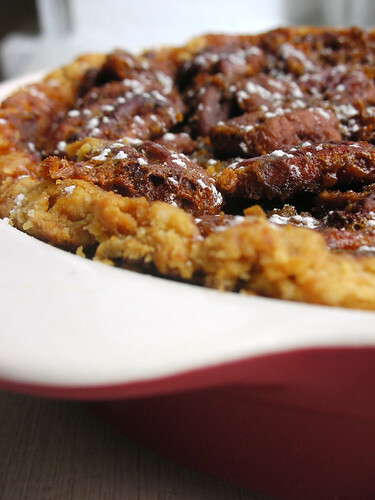 Check out the TWD Blogroll to find plenty of other baking tips for this pie! Your pie looks great! Good to know about the longer baking time–I’m going to start baking mine shortly (the pie dough is waiting in the fridge for me). Happy Thanksgiving! It turned out looking good! I am kinda wishing I had made it with the crust now, because your slice with the crust looks unbelievably delicious. Yum. wow, it looks great! I have never tried pumpkin pie – it is on my ‘to do’ list! Wahhh… what a beautiful pie! I’m glad you liked it even though it was tough on the eyes! Although, you always manage to make everything look so delicious! Thank you so much Steph, for participating with me this week… and a very happy Thanksgiving to you too! Glad to see that mini pie dish worked so well! Looks great. Happy Thanksgiving! Thanks – I had the same issue with the baking time. I kept adding 5 minutes, 5 minutes, then started upping the temp. I think the 300 degrees was too low. Ended up at 325 for the last bit. Mine also came out right at the end. It looks really incredible. I’m all about your bourbon substitution, sounds much better. Awesome – that crust looks wonderfully flaky. Bourbon + pecan > rum + pecan, I agree. Yum! What a great holiday pie! Yours is the best looking pie I’ve seen so far! I’m glad to see it because this is what I thought it should/would look like! What a great pie! 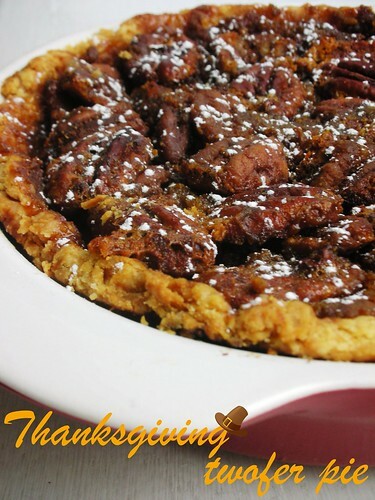 That is a great idea and I think I would love this even mroe than Pecan Pie as it is too sweet! Pie looks great. Looks like it came out just right. Your pie looks perfect, and your crust is amazing! Great job! It looks so good!